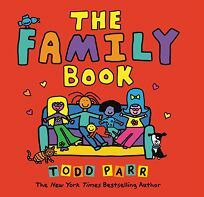 An all-inclusive look at a diverse array of families, The Family Book is the latest by Todd Parr. The book's simple statements of tolerance and love are accompanied by Parr's equally simple, bright-hued illustrations bordered by a thick black line. Parr runs the gamut of potential familial situations, from families that live far apart to those with ""two moms or two dads,"" conveying the message that no matter what little differences makes each unique, a family's love for each other is what really matters.